3 for £3 Instore and online at Tesco, normally prices at about £1.80 each. Seemed to be across all the flavours too, 450g pots, had about 4 weeks shelf life. 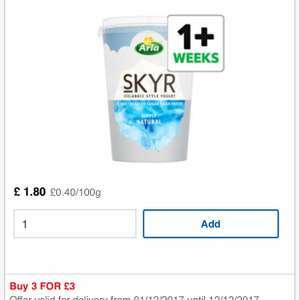 Does anyone know where we can get real skyr from? In Iceland, to me, the Skyr there tastes very different. Less sugary and a smoother texture. So much better! Yeah Milbona Skyr I think. Very good. The strawberry/vanilla ones are nice. Also like the Aldi Brooklea Skyr but these are smaller pots (Possibly 150g) and are 49p. The passion fruit Aldi ones are devine. These yogurts are perfect when you work out. I've never seen a yogurt containing more proteins. Unfortunately the new flavors coconut and lemon are not included in the offer. Yeah Milbona Skyr I think. Very good. The strawberry/vanilla ones are …Yeah Milbona Skyr I think. Very good. The strawberry/vanilla ones are nice. 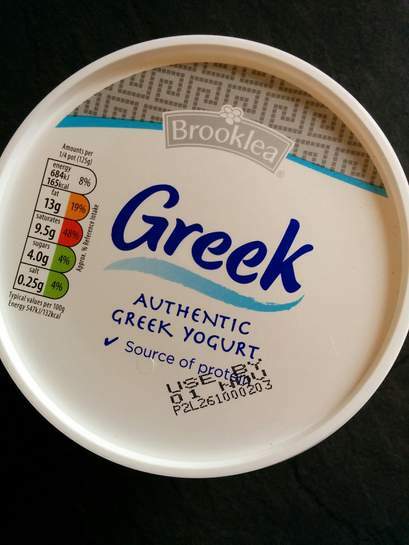 Also like the Aldi Brooklea Skyr but these are smaller pots (Possibly 150g) and are 49p. The passion fruit Aldi ones are devine. Really? Need to keep an eye out on these. Passion Fruit sounds amazing! Maybe its just me, but I wasn't impressed, the taste was just lacking. Probably better in Iceland. Much prefer the 500g Greek yoghurt (not Greek 'style' yoghurt) in Aldi.